As of June 2013, Singapore’s population reached a whopping 5.4 million people, and the government has been scaling up their efforts to provide citizens and PRs with housing; in a recent BTO exercise, HDB launched over 5,200 flats. If you’re an existing, new or future home owner, this helpful list of furnishing tips is just for you! 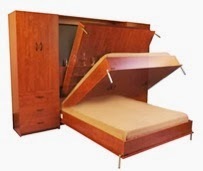 One of the furniture that takes up the most space in a room would be the bed. If you have a queen size bed, you’d be using up approximately 152cm by 191cm of floor space in your room. In a small HDB apartment, this might take up more than half of the area in your bedroom, yikes! An innovative solution to this issue would be the hidden wall bed, a type of bed frame which can be folded up against the wall when not in use, and then pulled back down when you’re ready to count sheeps. Another smart way to free up space in your home would be to cut down on the number of furniture that you have. Enter the multi-purpose furniture! Multi-purpose furniture is furniture that serves more than 1 function; there are many different types of multipurpose furniture, the most popular of which are furniture with an added storage function. For example, 1) the storage bed, 2) stool plus magazine rack and 3) sofa plus book case. If you visit the local home renovation and furnishing forums, you’ll find quite a number of threads where unhappy customers complain about product defects with their newly purchased furniture. You’ll want to look out for furniture stores that have a high number of complaints, and see whether the store was able to successfully resolve the customer’s issue. In addition to customer feedback online, other useful information to have includes 1) the furniture store’s return policy for their items, and 2) store recommendations from friends and family members. It goes without saying that to create more space in your house, you’ve got to remove some of your old items. As of November 2013, HDB has seen an increase in the number of hoarding cases. In the majority of these cases, the home owners involved just didn’t know how to go about removing their old furniture and items. The different ways to get rid of your old furniture would be to sell it, donate it or trash it. If you’re looking to sell your second hand furniture, you can consider selling it to used furniture dealers here. Alternatively, you can donate your furniture to charitable organisations like Pass It On and the Salvation Army. If you’re looking to save some money on your furniture purchases, a quick and easy way to do that would be to look for clearance sales online. Several furniture stores have a clearance sales or sales promotion section on their website, where they feature discounted items that they like to quickly sell off. These items are usually 1) outdated, 2) have minor defects, or 3) they’re the display furniture in the showroom. You can visit FurnitureSingapore.net for a big list of stores offering cheap furniture and furniture sales. Kelly Ong is the editor at FurnitureSingapore.net, a local website that provides a comprehensive listing of furniture stores and information to help consumers make better purchase decisions. Kelly enjoys discussing and writing about topics on home furnishing and décor. In her free time, she thinks of ways to beautify her living and working spaces.